If you're trying to decide which healthcare plan is right for you and your family, it helps to estimate your expenses. I really like this tool from Wage Works. You answer a few simple questions about the plan design (comparison of ASHA plans below) and then estimate the number of office visits you'll have, the number of prescriptions you'll fill, and any other money you'll spend on health care. You quickly wind up with a neat graph that shows the difference in the cost between the plans you're considering. If you want to take a more targeted approach, you can review your EOBs from the current plan year. If you're with UnitedHealthcare, log onto myuhc.com. Then, click view online statements. From there, you can see the allowed amount for each claim. 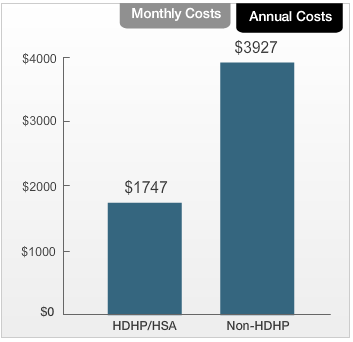 This is the amount you would pay with the money from an HSA before meeting the deductible in a health plan with a high deductible. For example, my visit to an orthopedic surgeon was $208, but the allowed amount was $116.32. Remember well visits are covered in full and not subject to the deductible, so don't include them in your estimates. You can also look at your EOBs to see what claims you had for lab, x-ray and other diagnostics and rehabilitative services like physical therapy. To see what you spend on prescriptions, you can go to the UnitedHealthcare Open Enrollment site. Click on the last link at the bottom of the page to price a medication. Type in the name of the medication, accept the disclaimer and you'll see an estimate of the cost of that drug along with some lower cost alternatives that might work for you. Often being in a high deductible health plan prompts people to discuss lower cost alternatives with their prescribing doctors. If you elect an HSA, you can set aside money for vision and dental services too. Just remember, those items won't count toward your health plan deductible. If you decide to stay with a more traditional plan, you can set aside up to $2,500 in an FSA to cover your out-of-pocket expenses.